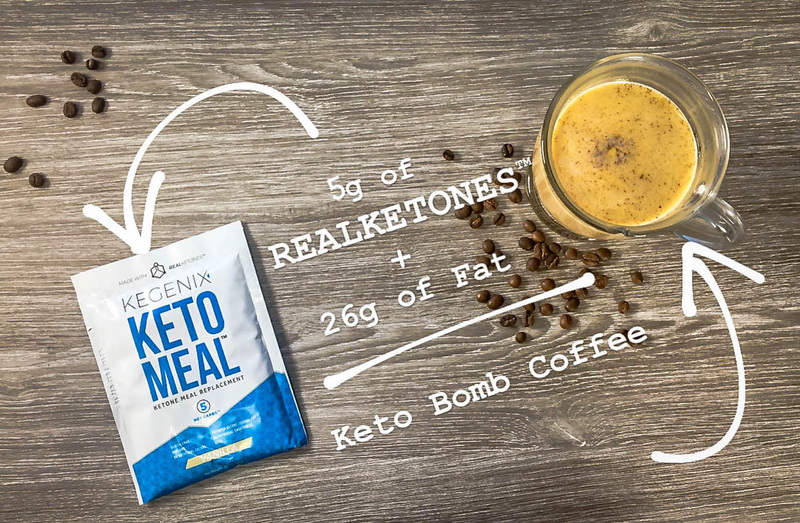 ​Your last coffee may have made you feel "bulletproof," but how will daily obstacles fair against you after having our Keto Bomb Coffee? Fuel your day by kicking it off with the exogenous ketone/coffee combination of your dreams. This is our take on the popular "bulletproof" coffee, but now with a whopping 26g of fat and 10g of Real Ketones™ per serving that is guaranteed to provide you with enhanced mental clarity, energy, and appetite suppression like never before. Grab your travel mug because after this you'll be ready to go, go, go! Fill up with 8-12oz of piping hot coffee of your choice. While your coffee is at it's hottest, you'll want to go ahead and add your butter to aid it in the melting proccess. Froth/blend until the coffee and butter are well incorporated. Next you'll want to add your scoop of Keto Meal, heavy whipping cream, and stevia. Blend/froth until a nice foam sits on top of your creation! Pour in your mug and get to sippin'!